Near the middle of the picture is a large dark rock. If one zooms in to this rock and then moves upwards one will come to a dark tray-looking object. I think that this is what the poster is refering to, however I think that it is far too speculative to consider that it is anything but a rock. Nevertheless, searching for destroyed buildings, especially, is valuable to EU because this would provide definite proof of electrical destruction. Man, I am impressed by those photos of the sand dune. I went through all the posts but quickly and did not find what I was looking for. If what I am about to say is a repeat, sorry. --that with your sand dune, your hand removed material lower on the slope that caused material higher up to slide down, creating the dendritic ridges. --on Mars, it was probably a huge electrical current that removed a lot a material (creating a large canyon in fact with Valles Marinaris). After the initial removal of material by the current flow, there was a lot of material left on the upper parts of the canyon that lacked support, and so it just slid down, just like the sand on your sand dune, creating the dendritic ridges there. --therefore, gravity created the dendritic ridges in both places, even though there were different causes that started the sliding of the material (removing material that supported other material higher up). Perhaps on Mars, there was also (only?) some amount of electrical "pulling" down of the higher material after it was undercut (or perhaps while it was being undercut), who knows. If this is too obvious, sorry. Thought it should be said on this thread. areas of excavation. I will explain further below. the arc creates a narrow dried out insulating zone around that the arc jumps across." areas in experiments conducted with CRT's and variations. as power was cycled. That material formed hanging dendritic patterns. current from a CRT surface to the discharge probe. accumulation would occur in an inverted dendritic pattern. during duststorms, creating and ongoing process of deposition. The following article contains several NASA photographs of light emanating outward from the surface of Mars a short distance from the rover vehicle. Currently, there is no official explanation from NASA. Before leaping to the conclusion that the light is artificial and comes from an underground civilization, recall that scientists have recently affirmed similar lights on Earth originating prior to and during earthquake events. 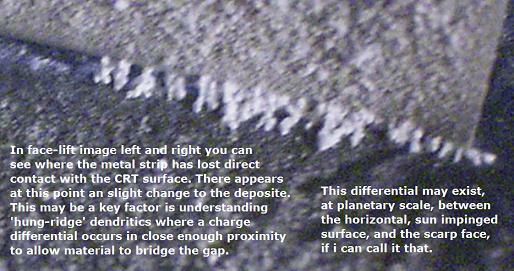 In brief, it is explained that pressures within rock formations cause charge separation and ionization which result in glowing particles releasing into the atmosphere. A cosmic ray striking the camera may be the best explanation. Looks like a plasma discharge to me. It looks exactly like the discharges we see coming from comets. Most of us here know that this is a common electrical event for Mars. michael.suede wrote: Looks like a plasma discharge to me. It looks exactly like the discharges we see coming from comets. Assuming it is a discharge and not a cosmic ray strike on a camera, what would account for such a discharge? Would annual dust storms put a static charge on the surface? Could the current alignment of the Sun, Earth and Mars play a role? "Swamp gas from a weather balloon was trapped in a thermal pocket and refracted the light from Venus." Dotini wrote: A cosmic ray striking the camera may be the best explanation. The adequately named "badastronomy" website describes it as a subatomic particle hitting the camera and leaving behind its trail of energy. These astrophysics people are really skilled in making up ad-hoc theories. If you're going to make a statement like that, you really need to show examples of other times this happened and not just make stuff up as you go. "In the thousands of images we've received from Curiosity, we see ones with bright spots nearly every week," said Justin Maki of NASA's Jet Propulsion Laboratory, Pasadena, Calif., leader of the team that built and operates the Navigation Camera. "These can be caused by cosmic-ray hits or sunlight glinting from rock surfaces, as the most likely explanations." because of this, sites like universe today and Technology.Org have concluded that it is an image artifact and not a light emanating from the surface. The bright spots appear in images from the right-eye camera of the stereo Navcam, but not in images taken within one second of those by the left-eye camera. Maki said, "Normally we can quickly identify the likely source of a bright spot in an image based on whether or not it occurs in both images of a stereo pair. In this case, it's not as straightforward because of a blocked view from the second camera on the first day." That confused me a little. This is a stereo image, but they are not taken at the same time, but rather "within one second" of each other? Can someone confirm if the Navcams do not take synchronized stereo images? We don't know how long this illumination lasted for, but we can say that it was "less than one second" if this is true. It would also help to know how long energetic particle hits saturate pixels on camera sensors and how that duration changes with the energy of the particles, and if there is any energetic particle data available. I will offer my opinion. In general, I don't rule out mundane or conventional explanations for reflections on the surfaces of planets or in atmospheres. Everything isn't "ET." But I looked up gamma ray traces and artifacts on photography (and in the human eye). Allegedly, gamma rays are not visible but will trigger the cones and rods in the human eye to "fire" off and create images or traces. Astronauts reported seeing myriad, short, sharp, flashes and flurries of "trails," or traces of point-like white things, even as they would close their eyes. These were determined to be gamma ray artifacts. So, in a sense, they ARE visible. The same goes for photo equipment. Photo gear will "see" things the human eye cannot and pick up electromagnetic wavelengths undetectable by the eyes (to add, insects perceive life through the UV spectrum so their experience of sight is quite different than humans). That said, why aren't the gamma rays exciting the cones and rods of eyes and cameras and visible 24/7, then? We should be "seeing" them with tremendous frequency, as should the photo equipment. Gamma rays are ubiquitous to the extent that we should be seeing or detecting a continuum of them, as in a uniform and enveloping fog or "white out" about the entire field of view. Or we should be seeing streaks of light or waveform envelopes from myriad directions as the gamma rays travel. But this isn't the case. What we are seeing in the Mars landscape is a point source of light reflected from something, or a point source itself emitting light. Enlarging the photo you will see that the pixels forming the point fade off around the center of the white area, indicating a glow. The point is glowing. Therefore the light drops off in the atmosphere around the source. In my opinion, that isn't a camera artifact but a recording of atmospheric effects around a light source. Moreover, I've had artifacts appear on my camera phone before, for example, and they don't glow with soft edges. Instead, they're typically hard-edged (and often amorphous) areas of discolored and bright pixels that indicate the camera's electronics are haywire. Once in a while I will get these when reviewing the pictures I took while downloading them. Electronic equipment of any sort can be sensitive to EM and even its own internal processing. So, yes, artifacts do occur. They are a real phenomenon. But the Mars photo doesn't fit this description as the point of light has traits indicating it is from an external source in the landscape. That is unknown. To write if off, knee-jerk style, as a mere artifact or "gamma ray" trace is, to me, glib and negligent. Instead of jumping to the conclusion, too, that it is "ET" is likewise foolish. But to mention that it must be one or the other is a strawman premise being built in front of the public. The article is negligent and dismissive. It frames the light as being either from ET--which is immediately dismissed after it is mentioned--or it is definitely from a gamma ray source depicted as an artifact of electronic processing. But it may be neither one. So why write an article like this? What if the light is actually external to the camera and is actually being emitted from something on the ridge? Why can't it be that? What if it is reflected light from a very shiny mineral? Why can't it be that? What if this mineral, once explored further, became a key signature and answer to some long held mystery? Why don't they drive the rover over to the light source and investigate it? I'd be all over that were it my choice. But instead they cooly dismiss it, adding "we get artifacts like this on photos all the time" and further make the point of light uninteresting. They may be overlooking something incredible on the photos under the influence of their culture of dismissal. It's most likely that these "raw" images have been calibrated in some way. Normal CCD calibration includes removing cosmic ray events. I would expect that a paper has been published on the calibration procedure for Curiosity (MSL). I'm going to try to find it. Because -- if cosmic ray events are removed, then it's hard to imagine that this is a cosmic ray event. I've spend quite a bit of time over the years looking at Mars images. I don't recall ever seeing a cosmic ray event on any Mars images, although they clearly should happen very very often (my own experience with astronomical imaging tells me this). Perhaps since these cameras are "hardened" for space, they block most cosmic ray events? I find that theory doubtful. So I have a hard time with the cosmic ray explanation. I also can't be too sure about the "glint" theory. Only one of the navcams saw this (the right one). The left navcam image, taken at the same time, shows nothing unusual. Check it out yourself at http://mars.jpl.nasa.gov/msl/multimedia/raw/ Left/Right Navigation Camera, Sol 559, timetag 2014-04-03 10:00:03 UTC. The earlier one is Sol 558, timetag 2014-04-02 09:04:28 UTC. Same thing: right navcam shows the event, left doesn't. Obs 1: These events are 24h 55m 35s apart. A "solar day" on Mars is 24h 39m 35s. A close correlation. Obs 2: Looking at the two images and blinking between them, it seems to me that whatever it is, it's in the same location on the surface in both images. However, I can't come up with an explanation as to why a glint would appear in one camera and not in the other. Cosmic rays could, however. But as I said above, I would think that cosmic rays would be filtered out during calibration. Then to have two in as many days doesn't seem likely. I think they should turn around and take a closer look. They have 30+ years of power, so why not? That rover should live up to it's name and here's a perfect chance to do so. CosmicLettuce wrote: It's most likely that these "raw" images have been calibrated in some way. Normal CCD calibration includes removing cosmic ray events. I would expect that a paper has been published on the calibration procedure for Curiosity (MSL). I'm going to try to find it. Because -- if cosmic ray events are removed, then it's hard to imagine that this is a cosmic ray event. I'm happy to read your post. It adds to the discussion in favor of the mystery versus "we've written it off as a cosmic ray artifact" allegation of JPL/NASA. I think they're highly evasive and glib here, to the point of being preposterous. Now if the right navcam were to have this arise again and again and again--while imaging differing locales and terrains--then I'd be more in favor of the thing being an artifact of the camera's electronics. They need to image more landscapes and see if the spot appears in the same place in the frame. If so, then it's an electronic issue. If not then it's a total mystery. It is in their lack of admission to a mystery that I find appalling. As you suggest, this is supposed to be a Curiosity. Not a waiving away of interesting events as being all figured out. Mars is barely understood despite the robotic probes sent there. They don't know about Mars. They want to think they do. If I'm not mistaken you can see the discharges on the ground as the dust devil travels as if it's equalizing some charge separation. Judging by the fact that it looks like something hit the surface it could have been a small meteorite right? During impact the negatively charged meteorite would quickly electrically discharge and release light. Because there is no atmosphere so to speak the meteorite would not be caught by the camera before the discharge event, simply because it would not have a significant tail trailing behind it. I might be way off here, but it's perhaps an interesting train of thought.